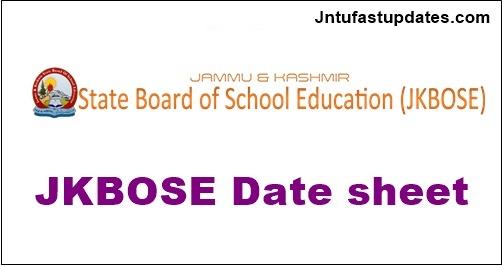 JKBOSE 10th Date Sheet 2019: Jammu and Kashmir Board Of Secondary Education has released the Date Sheet for SSE (Class 10th) Session Bi-Annual/Annual, Kashmir & jammu Division. Bi annual exams for class 10 students in the Kashmir Division will begin on 25th February 2019 and conclude on 14th March 2019. Annual exams for Class 10 students in jammu division will begin on 27th February 2019 and conclude on 19th March, 2019. The Board has released the date sheet on the official website of the Board i.e., jkbose.ac.in, indiaresults.com. Examinations are conducted separately for both Jammu and Kashmir divisions. JKBOSE 10th Class Date Sheet 2019 has been announced by the authority through online mode. Jammu and Kashmir Board of School Education (JKBOSE) conducts board exams annually for 10th and 12th class students every year. Last year 58293 students were appeared in the JKBOSE out of which maximum students cleared the examination with good scores. The date sheet of JKBOSE for the session 2019-2020 for the 10th and 12th class has been announced soon. The JK Board 10th Class Date Sheet 2019 has been declared by the JKBOSE conducting authority. Check the detailed information of JKBOSE 10th Class Date Sheet 2019 from this website. Download the Datesheet for Class 10th Jammu Division 2019 below. The Practical Examination in Science. Home Science, Computer Science and Music will be held fror 22-3-2019. Candidates concerned should contact Head of the Institutions concerned. Music/Painting/Art & Drawing and Home Science is meant for Blind/Deaf and Dumb candidate only in lieu of Mathematics and Science. The examinees are advised to adhere to the instructions strictly given on the back side of the adm cards to be issued to them in due course of time and bring the same (Admit Card) on all days of examination for verification. All Heads of Govt./Private Institutions of Jammu Division (Summer Zone areas) shall collect the Admit Cards of their candidates from the concerned BOSE Office (Sub/Bran It Offices/H0 office, Jammu) w.e.f 12 February, 2019. 1. The Candidates are advised to bring their Admit cards/Registration Cards on all examination days for verification. 2. The practical test shall he conducted immediatelly after termination of theory examination. The concerned candidates shall contact respecthe heads of Institutions /Sub/ Branch Board Offices and head Office Bemina. Srinagar regarding practical programme. 3. Examination Centre has been specified on Admit Card. As every year students are awaited for the exams to score for the good marks as they initial career begins with the SSC examinations. They are several government jobs which is related with the secondary school examination results. last year also many of them secured best results. Many of them choose the higher studies and the remaining are interested in jobs. Get start prepared from today itself to get the best results.